Choline supports healthy liver function by donating methyl groups necessary for detoxification reactions. Choline-phospholipids are extremely important structural elements of cells and are essential for the normal processing of dietary fat, a key function of the liver. In addition, adequate choline intakes have been associated with lower levels of plasma homocysteine, meaning choline can also play a role in hearth health. Hepasil DTX is an excellent source of choline. Hepasil DTX employs USANA�s innovative Nutritional Hybrid Technology. This state-of-the-art approach to formula design and manufacture features bilayer tableting: the separation of various formula ingredients into two distinct tablet layers. Now, for the first time, previously distinct products can be joined into a single formula. Incompatible ingredients can be combined in a single tablet. 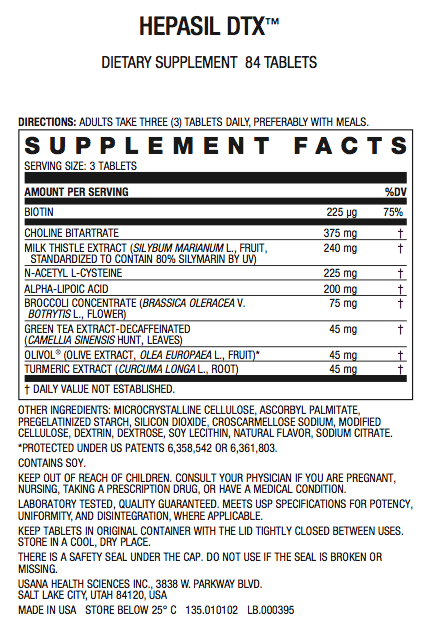 And key nutritional ingredients can be visually highlighted in distinct tablet layers USANA�s Nutritional Hybrid Technology opens the door to accelerated innovation in supplement design and manufacture. Proudly, USANA is among the first in the world to use Nutritional Hybrid Technology.